Muffin III's Story . . . Original: "........together the two foster moms realized that it was time to set Muffin free from her suffering." On Valentine’s Day, MAESSR got an urgent call for help from an urban Pennsylvania shelter saying that an elderly, infirm female ESS was just relinquished by her owners. Within hours, Muffin was pulled from the shelter and taken to her MAESSR foster home. 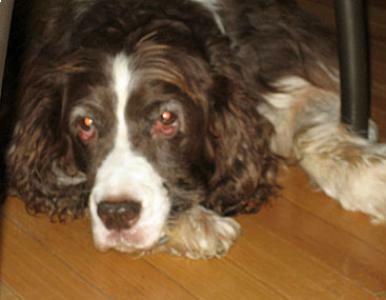 Muffin was in extremely bad shape, unable to get up on her own and suffering from severe arthritis. It was obvious that she was in great pain. Another MAESSR volunteer came to help, too, and together the two foster moms realized that it was time to set Muffin free from her suffering. The vet concurred with their decision. With these caring people by her side, Muffin went quietly to the Bridge. Although Muffin was only a MAESSR girl for less than a day, her foster family gave her what her original owners could not: a quiet, calm passing in a clean, warm house being comforted by people who cared for her and mourned her loss. 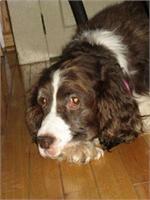 Run free, sweet Springer girl!